Charlotte Field (Charlize Theron) is one of the most influential women in the world. Smart, sophisticated, and accomplished, she’s a powerhouse diplomat with a talent for… well, mostly everything. Fred Flarsky (Seth Rogen) is a gifted and free-spirited journalist with an affinity for trouble. The two have nothing in common, except that she was his babysitter and first crush. When Fred unexpectedly reconnects with Charlotte, he charms her with his self-deprecating humour and his memories of her youthful idealism. As she prepares to make a run for the Presidency, Charlotte hires Fred as her speechwriter, much to the dismay of her trusted advisors. 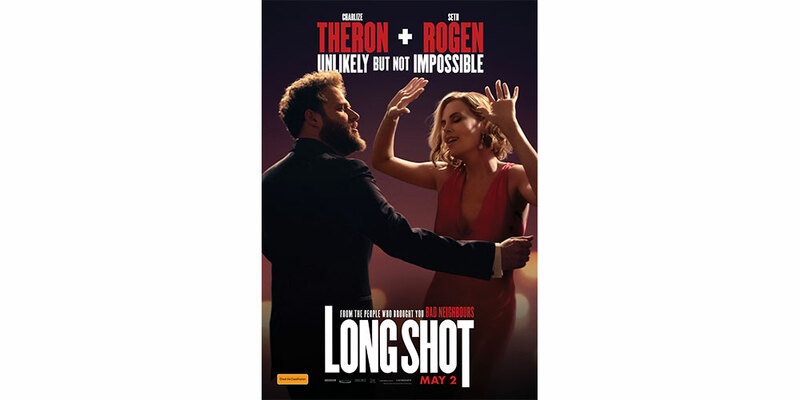 Long Shot opens in cinemas on Thursday 2 May, 2019. Prize 1 of 20 double passes [valid for 2 people] to Long Shot. Each double pass is valued at $42.